One of the five rallying cries of the Reformation was the statement that we are saved by faith alone—sola fide. These words declared that salvation does not come from looking at our own works of righteousness, but from looking outside ourselves to another, to the person and work of Jesus Christ. This statement grew out of a desire to return to the Scriptures and to the teachings of the early church fathers, a cry to reform the church and restore biblical orthodoxy. Five centuries have passed since the Reformation, and we may wonder: Does sola fide still matter today? Is the notion of justification by faith alone just a relic of days gone by, reflecting a nostalgia for a previous time? I believe the Reformation cry of sola fide should continue to be taught and treasured today because it summarizes biblical teaching—and God’s Word never loses its transforming power. The Word of God speaks in every era and in every place. While some may cling to sola fide merely to uphold tradition, we should cling to it because it accords with God’s Word. Justification by faith alone isn’t the product of rigid and brittle orthodoxy. It speaks to minds and hearts throughout history because it tackles one of the fundamental questions of our human condition: How can a person be right with God? But when we rise to the heavenly tribunal and place before our eyes that supreme Judge . . . by whose brightness the stars are darkened; at whose strength the mountains melt; by whose anger the earth is shaken; whose justice not even the angels are equal to bear; who does not make the guilty innocent; whose vengeance when once kindled penetrates even the lowest depths of hell . . . then in an instant the vain confidence of men perishes and falls and conscience is compelled . . . to confess that it has nothing upon which it can rely before God. And so it cries out with David, “Lord, if thou marked iniquity, who can stand?” . . . When the mind is thoroughly terrified with the consciousness of sin and a sense of God’s wrath, what is that thing on account of which he may be acquitted before God and be reckoned a righteous person? . . . Is it righteousness inhering in us and inchoate holiness, or the righteousness and obedience of Christ alone imputed to us? We must never forget why this biblical truth matters today. While some may wish to talk about theology for the sake of theological disputation, the central issue, as Turretin points out, is personal. We are talking about standing before God on the last day, on the day of judgment, and sola fide answers that question: How will we stand before the Holy One? Still, someone might agree that how we stand at the final judgment is a crucial question and still think justification by faith alone should be abandoned. After all, sola fide is easily misunderstood, and so they believe the slogan should be jettisoned. Why appeal to a slogan that must be qualified and explained to avoid abuse? But this objection applies to every theological truth. We don’t surrender the term “Trinity” because it’s frequently misunderstood. Instead, what we mean by “Trinity” must be carefully explained. We must carefully unpack what that term does and doesn’t mean, so that those who listen to us don’t think Christians are tritheists. Despite these challenges, however, we don’t abandon the word just because it’s sometimes misinterpreted. Sometimes Reformed Christians are accused of focusing too much energy on guarding and protecting doctrines and traditions like justification by faith alone. Perhaps, at times, we are guilty of emphasizing doctrinal fidelity to the neglect of cherishing the truth we confess. Yet guarding the faith is a noble and biblical endeavor. Jude 3 calls us to do so in no uncertain terms, and both Galatians and 2 Timothy emphasize that we must guard and uphold the gospel even when others deny it. Still, we must beware that our gospel-guarding efforts don’t become more important to us than cherishing the life-giving freedom and joy the gospel provides. We guard the truth because we cherish it, and we cherish the truth because it is our life. We guard the truth because we cherish it, and we cherish the truth because it is our life. When we are alone and quiet before God, we remember our many sins and our great unworthiness. In such moments we sense the glory and beauty of sola fide; we confess “nothing in my hand I bring, simply to the cross I cling.” We realize that we can enter boldly into God’s presence only because of God’s grace, through faith in the righteousness of Christ alone. Indeed, sola fide is vital because it reminds us of the grace of the gospel, testifying that our salvation—our standing and acceptance before God—is entirely from God. Human works cannot accomplish divine salvation. Thus sola fide ascribes all the glory to God, so that no one will boast in man (1 Cor. 1:31). It reminds us that everything we have is a gift (1 Cor. 4:7). The five solas of the Reformation are closely tied, but when it comes to sola fide there is an especially close link with sola gratia and solus Christus. Faith looks to another for salvation, so salvation is by grace alone and in Christ alone. The five solas of the Reformation are closely tied, but when it comes to sola fide there is an especially close link with sola gratia and solus Christus. A final word about the use of slogans and doctrines. Anthony Lane rightly says doctrines are maps and models, not mathematical formulas. So we must avoid relying on simplistic appeals to sola fide, or condemning without conversation or understanding those who reject the term. Instead, we should ask what those who reject sola fide intend when they question its adequacy. Perhaps those who reject it and those who affirm it are speaking past each other. The fears of those who reject sola fide may constitute legitimate objections to misunderstandings of the phrase. To be clear, I’m not saying all disagreements are mere misunderstandings. I’m saying we should be open to dialogue so we don’t too quickly assume that we disagree. Slogans like sola fide are helpful, for they summarize briefly our theology, but slogans can also be dangerous, for we may be in a conversation where we’re unknowingly operating with different definitions and concepts. Before we indict someone else, let’s be sure we’ve heard what they’re truly saying. 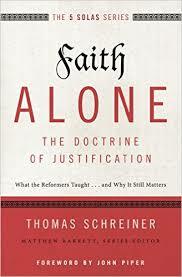 Editors’ note: This is an adapted excerpt from Thomas Schreiner’s book Faith Alone: The Doctrine of Justification (Zondervan, 2015) [review]. It is the first volume in The 5 Solas Series.